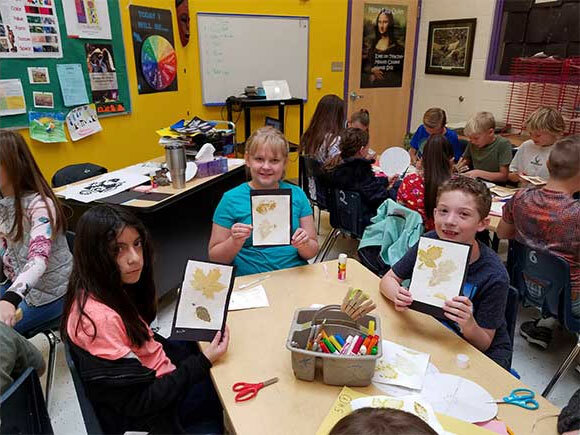 Melanie Haslam is the BTSALP Visual Art Specialist at Canyon Elementary School in Cache County. Follow along step by step as she brings Science, History and Visual Art together with Eco Printing. A big thank you to Melanie for an excellent lesson and blog post! Have the watercolor paper cut and soaking in the trays of water with diluted mordants (directions below). Put fresh leaves out on the tables in containers. 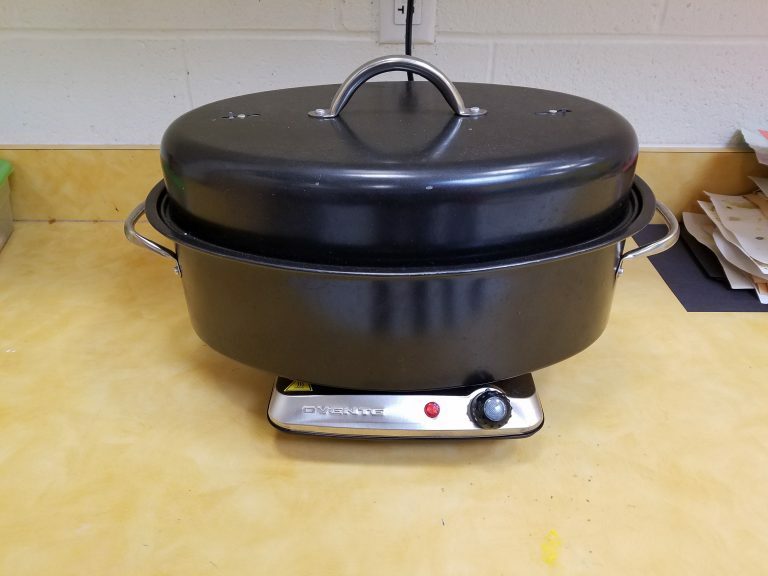 Make sure your pot is ready to go! When I was in college, I worked for a few summers as a docent at This Is The Place Heritage Park in Salt Lake City. As a docent, I would demonstrate skills practiced by the 19th century Utah pioneers, like churning butter, making soap, cooking outside, etc. It was the best summer job ever! One of the most fascinating things I learned, was the process of textile making–from the sheep to a usable article of clothing. And to me, the most interesting part of that process was the art of textile dyeing. With that in mind, I wanted to introduce that concept to my fifth graders through the art of eco-printing! Fifth graders are introduced to chemistry in their regular classroom through their science core curriculum. I wanted to show how chemistry can be used to create beautiful artwork, while tying it into the ancient process of textile dyeing. I began our lesson by discussing clothes. I asked them about their favorite colors and if they had ever even wondered about where those beautiful colors came from. Out of 100 fifth graders, only one admitted to even thinking about that. We talked about what colors clothes would be if we had no dyes for them. My students came up with “sheep colored.” We then hypothesized what people a long time ago might have used to dye their clothing: berries, juices, etc. They agreed that most colors probably came from plants. I introduced them to the idea of how chemistry plays a role in getting the dye from the plants to permanently stain the fabrics, and how these different substances (or mordants) react with these plants to get different results. The two mordants used were iron oxide and alum. I had mixed up the iron oxide mordant a few weeks ago, using rusty nails and bolts soaked in a 50/50 vinegar and water solution (it needs to sit for awhile to gain full potency). A quick shout-out to Mr. Hawkes, fifth grade teacher who helped round up some rusty things! I then diluted it with water until it was a light brown color and poured it into one of the trays. 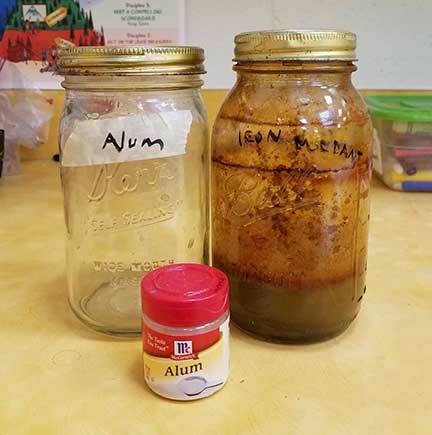 Alum is another mordant that has been used for over a thousand years, and is now used in canning and pickling (you can find it in the spices section of the grocery store). I dissolved a couple of tablespoons in a gallon of water, and put that solution in my other tray (this solution will be clear). 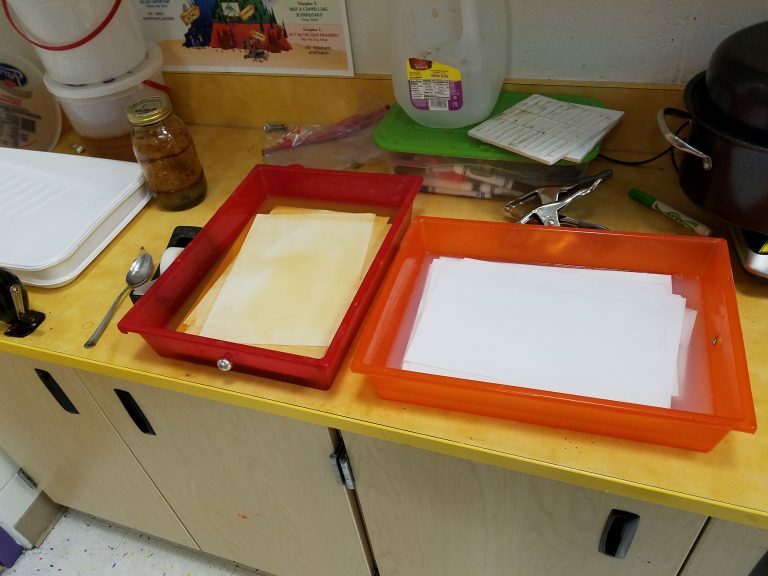 I had put the watercolor paper in to soak before my students came in. I used watercolor paper (ideally, fabric would have been fantastic, but there is enough cotton in the watercolor paper for this to work). 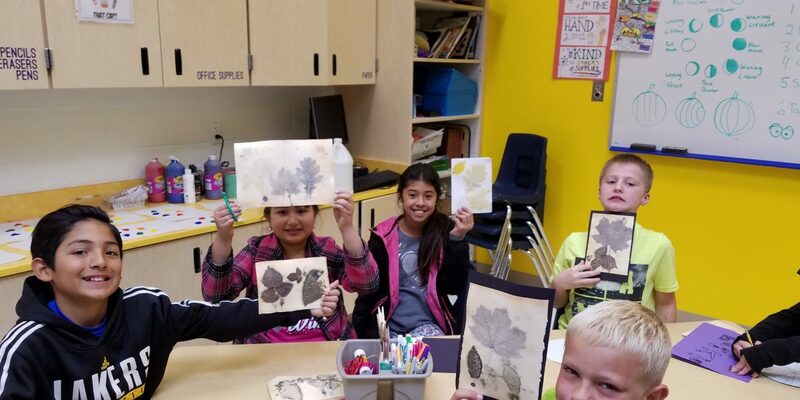 After explaining what a mordant was, I showed them a few examples I had done of eco-printing–making leaf prints using the reactions of the natural tannins in the leaves with the mordants. We talked about in the true dyeing process, how just the tannins in a soup-like solution would be used for dyeing, but for our project, we would use the entire leaf. The students noticed how the same leaves made different colors depending on the mordant used. We looked at the leaves, and observed how one side of the leaf is smooth, and the back side is rough. I explained how the underside of the leaf has the pores, and the tannins (or dyes) come out of the pores when the leaf is exposed to the mordant and put under heat and pressure. I demonstrated how an eco print is made. I chose a piece of watercolor paper from one of the mordant solutions. I then folded the paper in half like a card and opened it. I arranged the leaves, pore side down, on one half of the wet paper, then closed it (the paper needs to be folded to prevent the dyes from leaking onto other peoples’ papers). I allowed the students to choose their papers and get started. 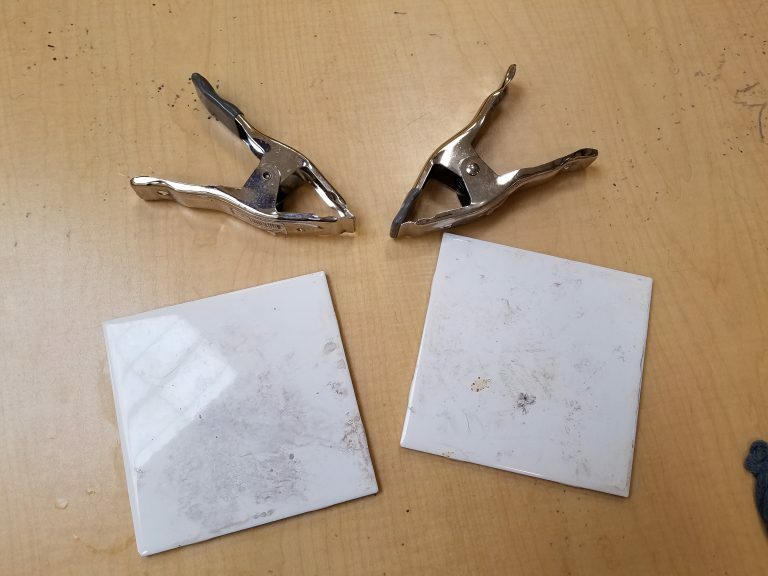 Students marked their names on the wet paper with a ball point pen in the corner. It was the best idea I could come up with–permanent marker steams away. Once I had a stack, I sandwiched the paper between two tiles and clamped them (pressure!). I put it in my trusty turkey roaster on the wire rack with some water in the bottom for steam. I steamed it for an hour using the hot plate (heat!). Unfortunately, the leaves need to be removed right away while the paper is still hot, so we weren’t able to see the big reveal right away. I tried to coordinate with their teachers to bring it to their classroom, but we couldn’t get a time to work. Next year! The next week, they got their prints back. Since the print is primarily only on one side of the paper, I asked the students to slice it in half and mount it on black paper. They were pretty impressed with the results and got to see chemistry in action! They were impressed that some of the colors produced were not the same as the color of the original leaf, and that the same leaf made different colors depending on the mordants used. Next year, I want to try this process with a few different mordants, and try some combinations with indigo and cochineal.